I intended making a visual collection of seasonal fruit and vegetables as they appear and was going to start this in spring, I decided to start earlier. Persimmon (also known as Sharon Fruit. 감, 땡감, 반시, 홍시/연시,꽃감.) Early December and the Persimmon season is over but these ones I bought a few weeks ago. Currently I have around 60 Persimmon in my freezer. Persimmon is called Kam and like the octopus, there are three types each called by a different name which can be confusing. Kam range from hard to very, very soft. If you like sweet and gooey you’ll love the hongshi, sometimes spelt yonshi. This is the softest persimmon and appears in late summer to early winter. It is very delicate, like a fragile bag of water. 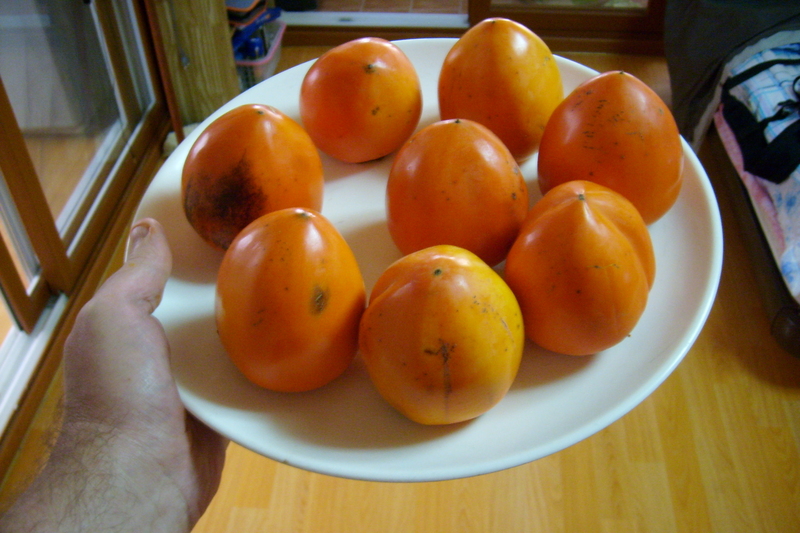 Unlike the other types of persimmon, which I don’t eat often, these can be easily frozen. They are delicious cold, simply slice the skin and squeeze and scoop out the jam-like innards. Some coffee shops serve hongshi smoothie. You can also buy dried persimmon, rather like dried apricots but with less flavour. I’m told persimmon is quite high in calories – which is usual as anything delicious tends to be calorie laden. The Oriental Quince (Moghwa. 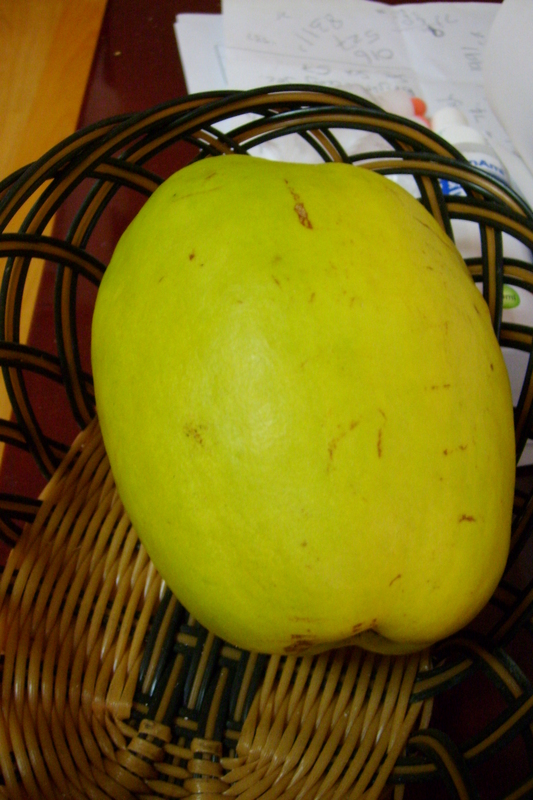 모과) , is used for its fragrance which is slightly appleley. It has a waxy skin. They do scent small areas like cars and small rooms but unless you dangle them under your nose, they’re pretty useless in larger spaces – but they look good. Moghwa appear in late summer and early winter. Make sure there are no small holes in them as these will contain worms. I had one with a small hole which were fruit flies front door, a piece of gum blocked future access and entombed any inhabitants. If you turn the fruit regularly it should keep into the spring. The moghwa is used in oriental medicine and can be used to make tea. Apples. 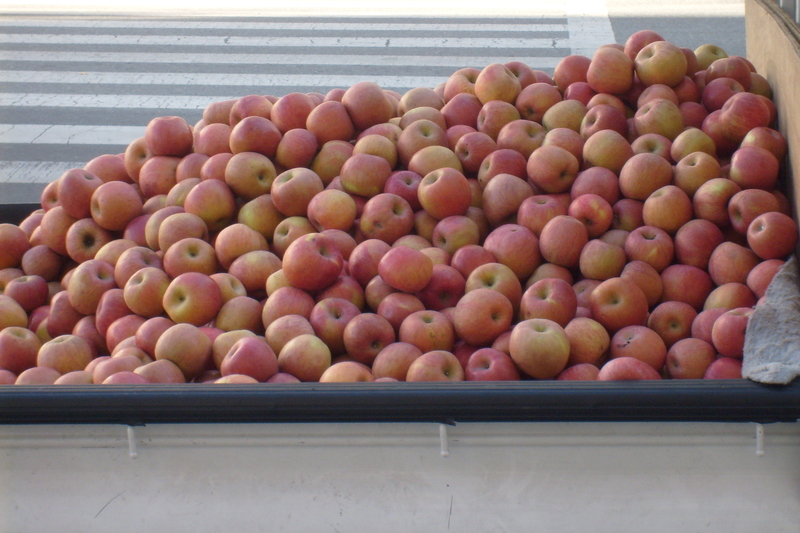 (사과) I live in Daegu which is renowned for apples and Daegu apples are truly delicious. In England, I rarely eat apples partly as there are so many varieties I never know which ones I like and because they can never be relied upon to be tasty. I suppose the variations in British weather result in fruit which can be sweet one moment and sour the next. Daegu apples are never sour and they are never fluffy or soft. Some are truly massive in proportions. Recently, a Korean teenager told me that had Snow White been Korean, she wouldn’t have died because Koreans always peel the skin off apples and pears. (and the witch, so he said, put the poison on the skin). In England we tend to wash them, if we can be bothered, and eat them with the skin on – a habit many Koreans find odd. My God! 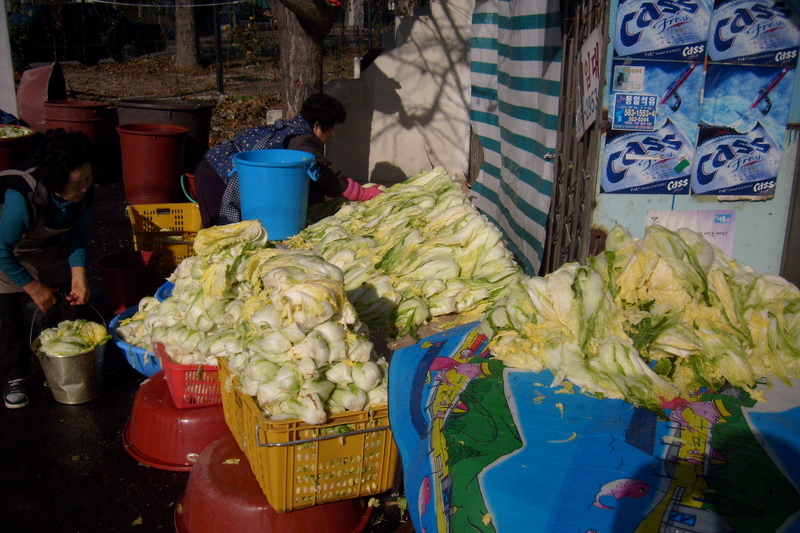 I nearly forgot the most important seasonal product of all… The Cabbage – usually called a paech’u (배추) As with most imported fruits and vegetables which I might buy back home, the Chinese Cabbage ( which I think is a pak choy – or maybe its a bok choy??? ), is a piddly little thing which usually sits in the palm of your hand, is almost pure white and has no green leaves and cost W2000. 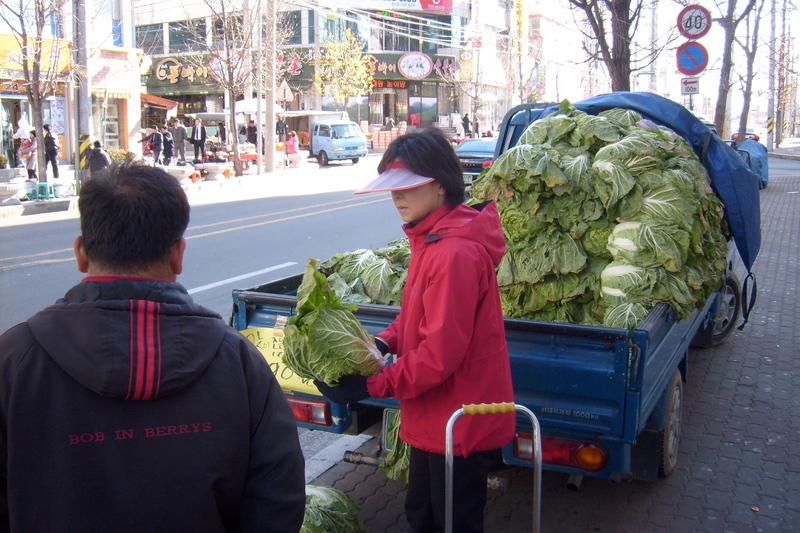 In Korea when the cabbage season is at its peak, some are colossal in size and this week in the market they cost around W1000 each which is about 50 pence in sterling. Two will make me enough kimchi for several months. Check inner leaves for signs of caterpillar. An occasional site, especially in more rural areas, are large vats of paech’u being salted ready for making kimchi. 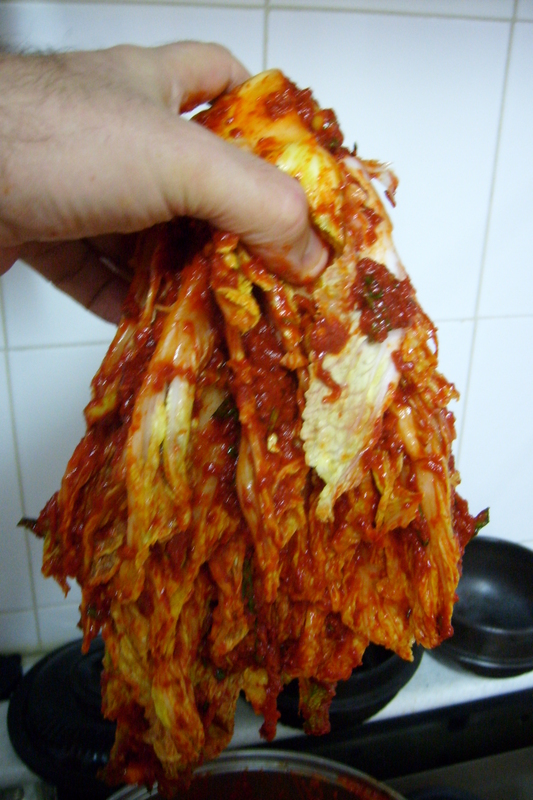 Indeed, in street markets at this time of year you can buy kimchi which has already been soaked in salted water. Paech’u after being salted and pasted with kimchi paste. Yes, it looks like something from a road accident but it tasted delicious! persimmon – 감, hard – 땡감, between soft and very soft -반시, very soft – 홍시 or 연시, and dried – 꽃감. Oriental Quince (moghwa) – 모과, apple – 사과, Chinese cabbage – 배추.